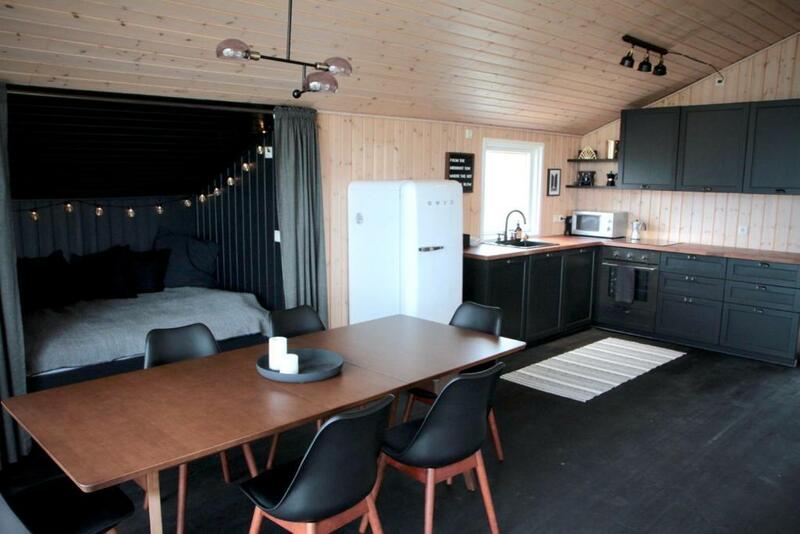 This cabin is in a perfect location for taking in the Golden Circle over a few days. The place is clean, fresh, modern and hip. The views are absolutely breathtaking out of every single window. Everything we wanted to go see seemed to only be a ten minute drive, yet we felt treated to an off the beaten path location. 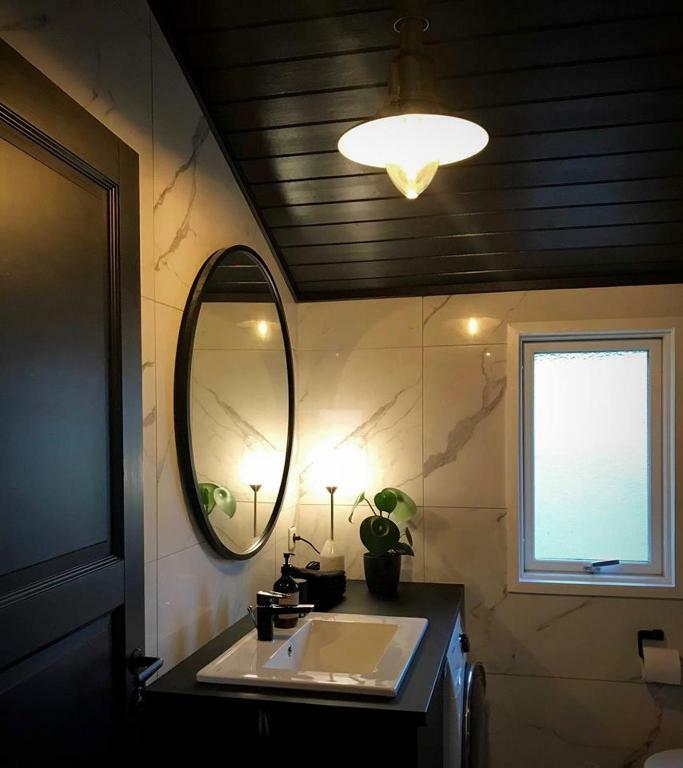 The owner's have a paid great attention to detail and include a humorous and informative "Survival Guide" with details on the property and things to do in the area. Great view. All wooden furniture. Nice and warm at arrival. Very responsive and helpful host. Very well equiped kitchen with lots of supplies included. Great sound installation. LPs with great choice of music. Great location to see lots of things in south (west) Iceland. From the very second we stepped foot inside the door of this amazing home, we were amazed! Every single window gives you a new perspective of the land that surrounds you. A group of travelling photographers, you have no idea how much we were inspired by our surroundings! The cabin itself was AMAZING, super warm and cozy with the best facilities and the view from the outdoor hot tub was sensational. The cabin was such a great location for sightseeing and touring and it was so central. It was the perfect space for us to kick back and chill out after a long days adventuring! LOVE the record collection- I think Fleetwood Mac was on repeat for the 5 days, such great taste in music! I cannot wait to get back to Iceland and stay here again! The cabin was so cosy and stylish! Well located, remote yet only a short drive to landmarks in the golden circle (e.g. we went to gulfoss waterfall, friðheimar, geysir). 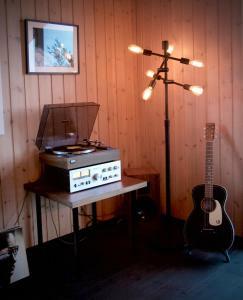 Great kitchen facilities for doing some cooking too and we enjoyed listening to music from the record player. The host was very helpful - easy to contact when needed and provided lots of tips about what to do in the local area. Everything about this venue is incredible. The little details in the design make the cabin so special! The view and the overall look and feel matches any 5 star hotel I have been in! Please continue the great work. Anyone doing the golden circle should stay here! The stars and the views at night were incredible. Having breakfast overlooking Iceland’s greatest scenery was very special! Not to mention the hot tub! The photos don’t do the view justice it’s truly very special. Thank you for having us! We will be back! Views beyond imagination.Excellent equipment. Close to the interesting sights. Even saw the northern lights above our heads in the geothermal hot tub. Spectacular experience. This place was amazing, beautiful views, a wonderful host. The old school record player and hot tub were brilliant. I’d recommend this place to anyone. Es ist eine coole Unterkunft mit Plattenspieler und Hot Tube in schöner Lage. Gut beschrieben. Lock in a great price for Hilltop Cabin Hekla - Golden Circle, Mountain view – rated 9.8 by recent guests! 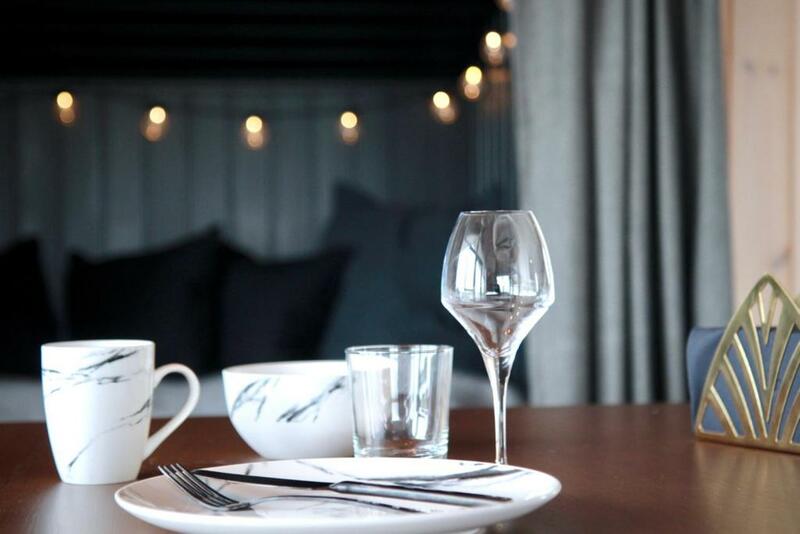 One of our top picks in Reykholt – and a guest favorite. 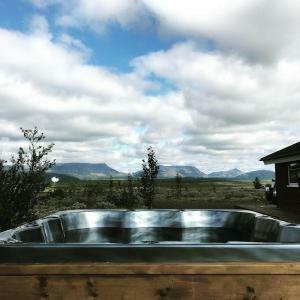 Located in Reykholt in the Suðurland region, Hilltop Cabin Hekla - Golden Circle, Mountain view has a terrace. The property features free WiFi. The vacation home has 3 bedrooms, a fully equipped kitchen with a dishwasher, and 1 bathroom with a hot tub and free toiletries. The wellness area at the vacation home is comprised of a hot spring bath and a hot tub. This property provides a grill. The nearest airport is Reykjavík Airport, 62 miles from the property. This property also has one of the top-rated locations in Reykholt! Guests are happier about it compared to other properties in the area. This property is also rated for the best value in Reykholt! Guests are getting more for their money when compared to other properties in this city. 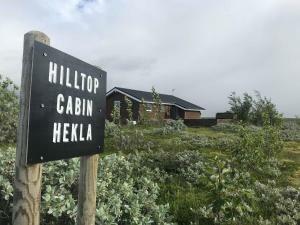 When would you like to stay at Hilltop Cabin Hekla - Golden Circle, Mountain view? This villa has a dishwasher, electric kettle and hot tub. After a full day of experiencing the unique nature of Iceland relax in a stylish cabin with modern comforts. What could possibly be better than to enjoy the Midnight Sun or the Northern Lights in a hot tub with water from the local hotspring? Me and my husband Hallur are 40 years old and we are parents of 3 children. We live in a town outside of Reykjavík. I own an interior design shop in Reykjavík called Esja Dekor, and my husband is a journalist and a videographer for Iceland´s oldest and biggest newspaper Morgunblaðið, and most popular web Mbl. 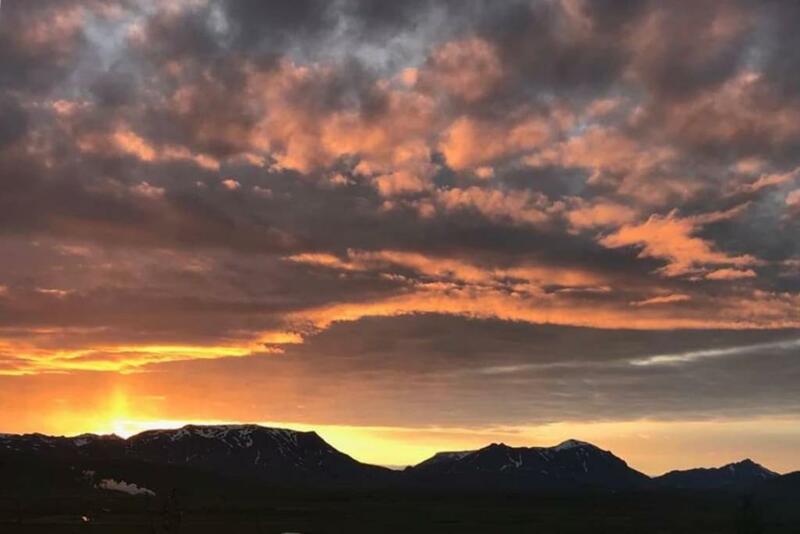 We absolutely love the Icelandic nature and countryside, and love to be able to escape to our cabin with the great view of mountains, glaciers and volcanos. The area around the cabin offers a lot of activities for us and for the kids. Located right in the Golden circle in the heart of South of Iceland, Hilltop Cabin Hekla is only a few minutes away from the countries most popular attractions. A fifteen minute drive takes you to the magnificent hotspring Geysir and the iconic Gullfoss is not far away. On the way you can experience Þingvellir, a World Heritage site. House Rules Hilltop Cabin Hekla - Golden Circle, Mountain view takes special requests – add in the next step! A better place to put our 5 pairs of hiking boots. A word of warning: weather conditions (snow early April and some potholes) meant that the last ~200m access with our 4WD rental car was just about ok (don't try without 4WD). I guess in winter you'll need a jeep or with higher undercarriage. Amazing cabin in a great location! It may feel remote in high winds and snow during the winter months. It would have been nice to stay a few more days!